It hardly needs saying that 1968 was a year that forever changed the global social, cultural, and political landscape. The world over, the historically marginalized and disenfranchised spoke out against what they perceived as the criminal indifference of those in power. 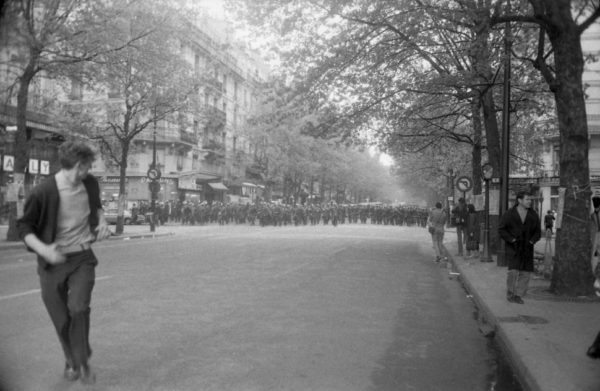 In France, these protests consisted of strikes, occupations, and demonstrations against the de Gaulle administration that became collectively known as Mai 68. The movement’s uniqueness lay in its ability to encompass all segments of French society, from student activists like Daniel Cohn- Bendit, to factory workers, to prominent artists such as Jean-Luc Godard. This revolution, along with the artistic and cultural products it engendered, would play an important role in pushing France towards an era of increased individual liberty and intellectual diversity. From the hard and unyielding paving stones of the barricades emerged a creativity and openness to experimentation that would heavily influence the artistic production of the next 50 years… “sous les pavés, la plage!”* In the US quite similar impulses had already fostered the rise of the Students for Democratic Society, and a so-called “New Left” opposition to the intellectualism of the Old Left. As in Paris, rebellion and resistance took the form of public protest and active dissidence against state and corporate power. To commemorate the 50th anniversary of the Mai 68 protests, The Cultural Services of the Consulate General of France in Atlanta, in partnership with the Association of Friends of Philippe Gras and quatre Planètes Films, propose Au Coeur de Mai 68, an exposition in two parts featuring entirely new perspectives and previously unseen content now available to the public for the first time. The exhibition was made possible with thanks to Alexandre Durand and Kathryn Miner of the Consulate general of France in Atlanta, as well as Professor Laurel Schneider and Laura Dossett of the Department of French and Italian, Joseph Mella and Margaret Walker of the Vanderbilt Fine Arts Gallery, and Dean Chris Guthrie and Bonnie Bielec of the Vanderbilt Law School.